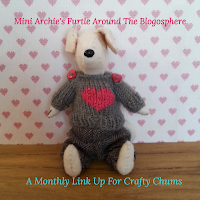 My new FAL list contains two new items which makes a pleasant change, don't you think?! Lynz and I are knitting in tandem (and holding each other's hands through the tricky bits!) in a very informal knit along which, at the moment, has a lovely slow pace to it! 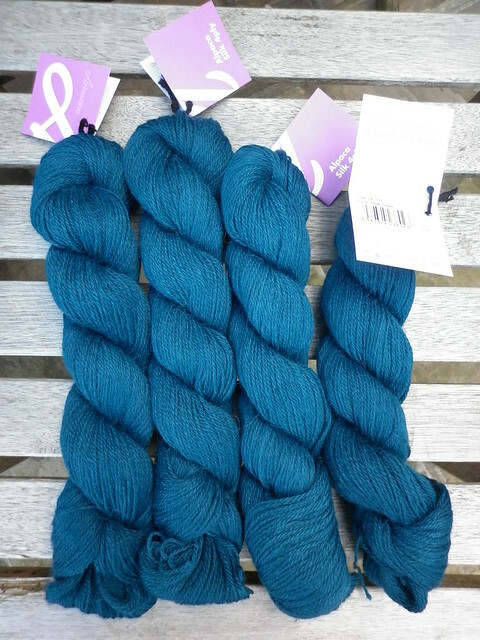 The yarn was found by Lynz at Maple Tree Yarns and was a bit of a bargain as it's no longer going to be stocked - there are a few skeins left in the shop and when it's gone, it's gone! My yarn is 'Drake' and is gorgeous but hard to photograph, or that's my excuse! 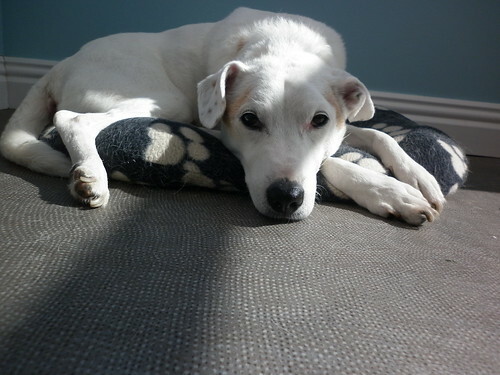 * Warning: if you follow this link be prepared to fall in love several times over! 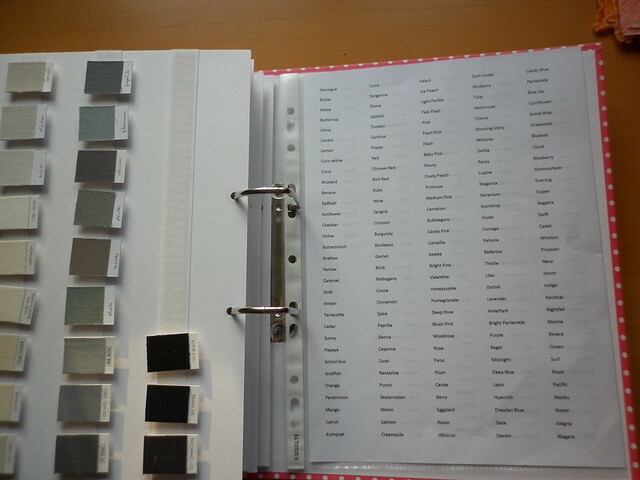 I have already made a mental list of things I want to make! 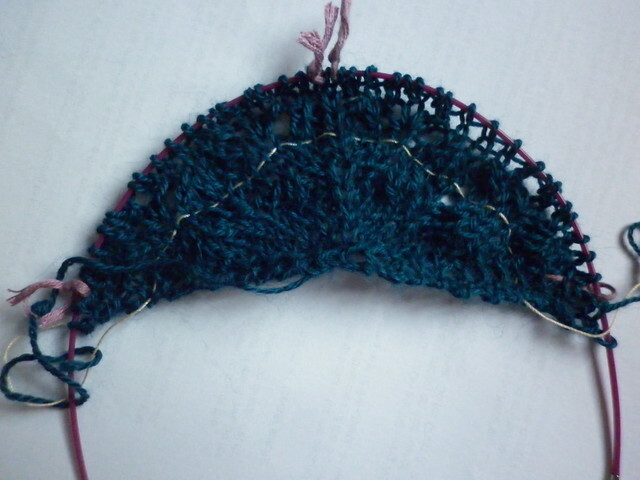 It doesn't look much yet but I can already see the pattern forming and it's lovely! I've also learnt two new stitches (a 3 from 1 (where you knit into the stitch two rows below) and SSP) and it's nice to add to my limited knitting repertoire/skills while getting a head start on Christmas presents! The second new item on my FAL list is a niece for my youngest niece. She's been in a 'big girl' (i.e. single!) bed for quite a while now (well over a year) but is still waiting for a quilt to go on it. Her birthday is in July and I've decided that my present to her will be her quilt. Given that I have less that four months to cut, piece and quilt it, I've designed a very simple quilt so that I have a fighting chance of making my deadline. It's based on the Stained Quilt by Sarah; I've made a version of this quilt before (find it here but please excuse the shocking photo!) and enjoyed it so much that I'm making it again. One day I'll make Sarah's original pattern but for now I'm enjoying designing my own blocks, based around the fabric I have/want to use. 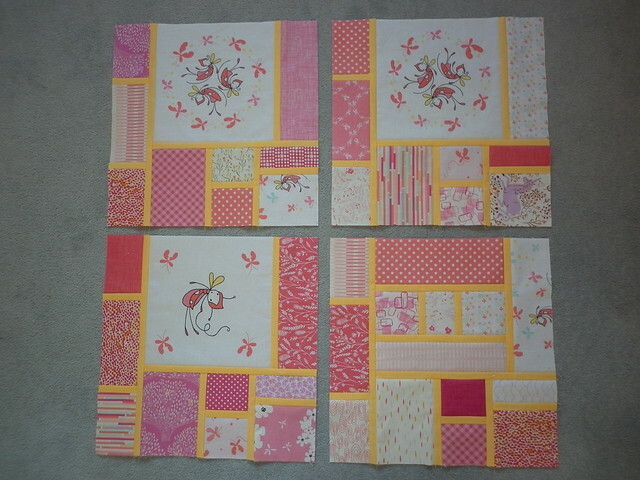 The quilt is based around two panels of Butterfly Dance (by Natalie Lymer/Cinderberry Stitches), includes lots of pink fabrics (my pink scrap box is considerably emptier than it was!) and Kona Daffodil for the sashing. 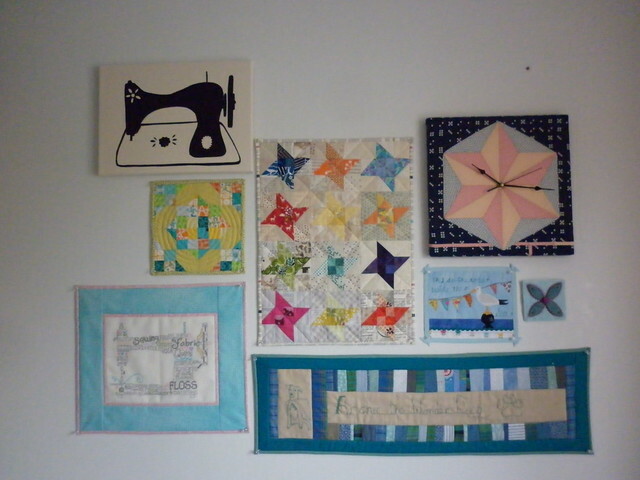 I need 28 15" blocks for the quilt (it has to be large enough to cover the bed from tip to toe, including pillows!) so I've designed seven blocks and am making four of each block. 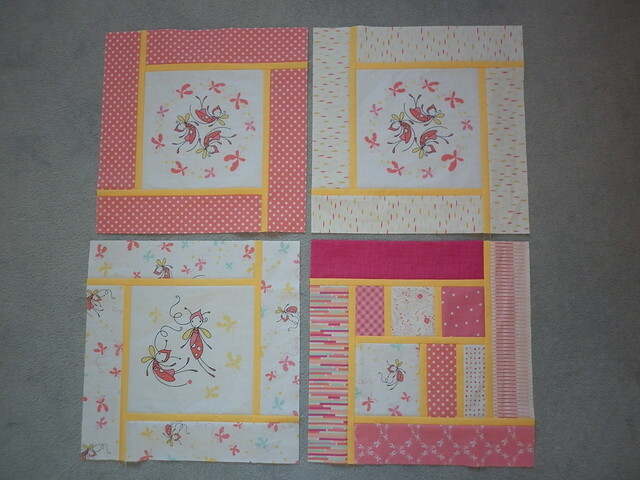 As I only have eighteen 'fairy' squares (I know they're really butterflies but I can't help but think of this as 'The Fairy Quilt' so I'm calling them fairies! 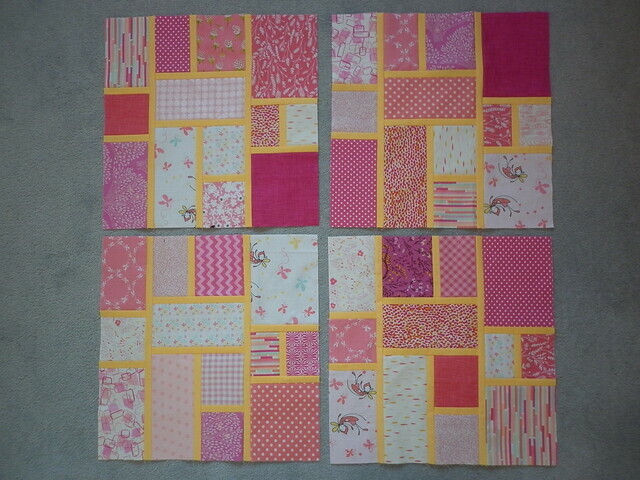 ), one each of block designs one to six won't have a fairy square and block seven has been designed to not need them. I started piecing the block seven designs first, partly because I cut/prepped the blocks in numerical order so these were at the top of the pile and partly because these blocks have the most pieces so I thought it would be nice to get them done at the start and then have the blocks get faster to make from there on in! 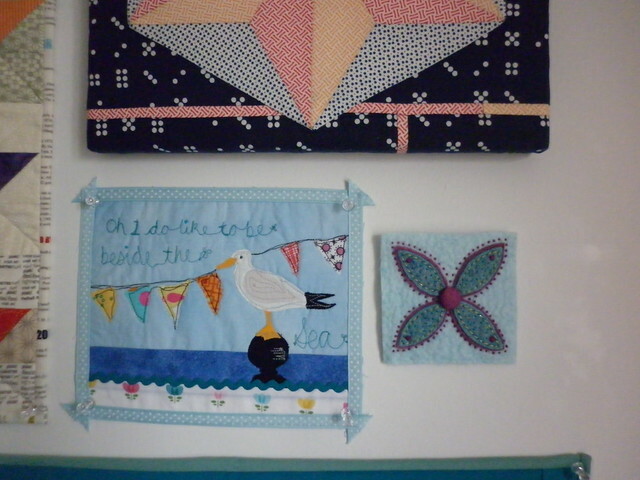 and I've also pieced block 4D but I'll show you that when its friends are pieced! I'm hoping to have all the blocks pieced by the end of the first week in May so that I can faff round with the layout and then start sashing and joining them together by mid-May. Wish me luck! Thank you Rachel and Tammy! 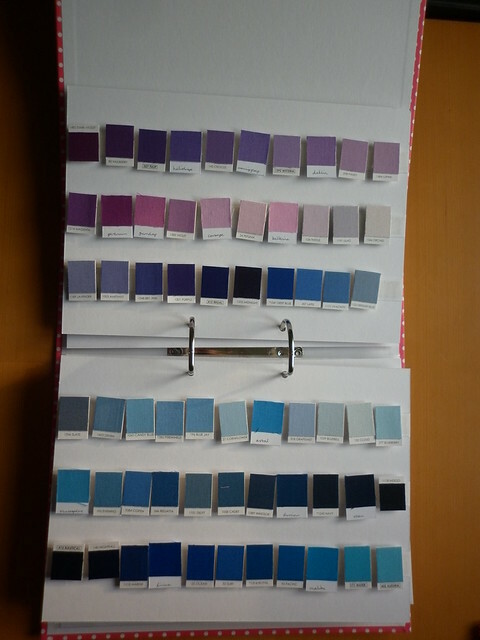 It proved invaluable when choosing the sashing in the fairy quilt as I could put all the possibilities on various pink fabrics and choose the best, without wondering whether the colours either side were affecting my perception. 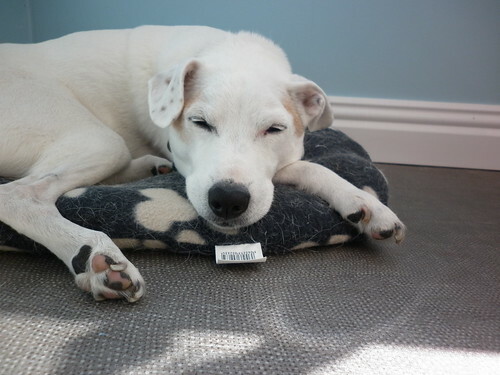 He might not look it but he was sound asleep when I took this photo - if you listen carefully you can hear the whiffle which accompanies this state! 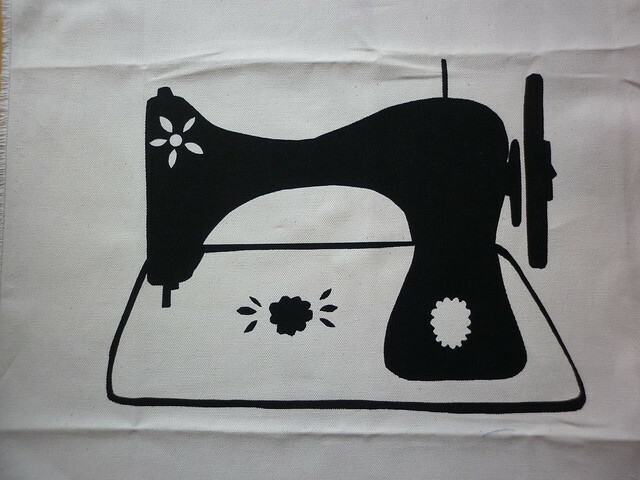 Thanks for popping in, I'm off to do a spot of hand quilting (on my hexy quilt) before I go to bed! FAL Q1 2015 - Four Finishes! I feel I've done quite well this quarter, particularly when you take into account that I've probably spent more time asleep than awake in the last three months. And that my machine was out of action from just after putting the binding on the Dresden mini (end of January) until about a week ago - that's why most of my finishes only required hand sewing (or no sewing at all, in one case!). My list is here, in case you fancy seeing what I didn't finish! Sorry about the dreadful photo but that's the middle of a dreary day for you! This was machine pieced, hand appliquéd, embroidered and hand quilted. 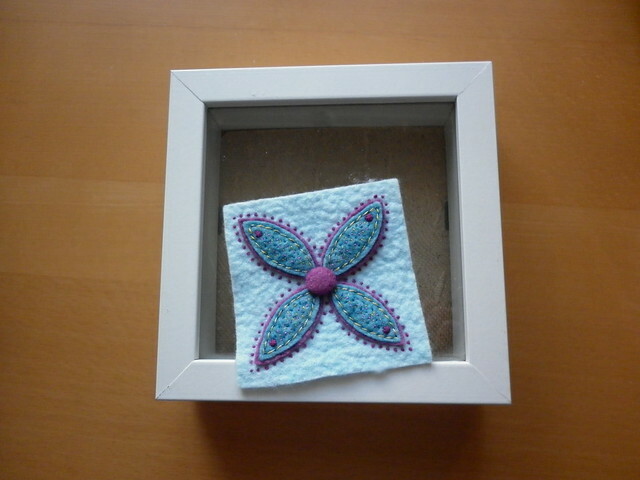 It measures about 14" square (I think, I can't quite remember now!) and has a couple of extra layers of wadding behind the centre to give a bit more texture. You can find out more about it in this post. 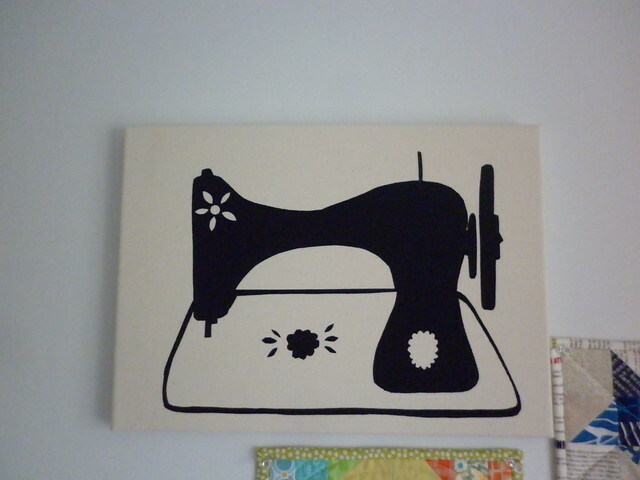 This is 12" square and the gubbins to make it (canvas block and clock doings (mechanism?!)) were kindly provided by Nicky. 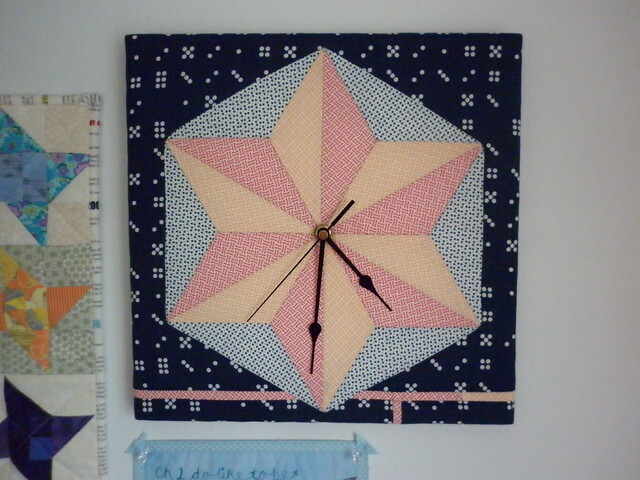 I hand pieced the hexagon and background and then appliquéd the hexagon in place. It was then stretched over the canvas and is held in place with lots of drawing pins. You can find out more about it in this post. In the end, I added a simple back, loops and a cocktail stick and it's now on the wall. You can read more about it in this post. This print was a present from Susan - thank you! As this final finish didn't, in the end, require any stitching, I'm going to leave it to Adrianne's discretion about whether it can be counted as an official FAL finish. Minis made by various friends (and a few by me) - ignore the black mark above the clock, that's where the bookcases used to be tied to the wall. 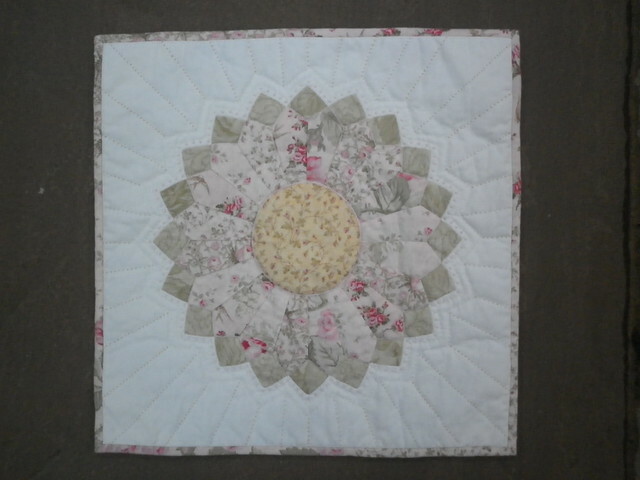 I'm not going to bother filling it in (at the moment), I'm just going to cover it with another little quilt! I really must get round to putting some more pins in that banner (by Nicky) and moving my other banner (by Sheila) to this wall! What do you mean, 'The Easter Bunny doesn't visit dogs?' I've been waiting all morning to catch a glimpse of him. I'll clear my list one day, I hope! I think part of the problem was that I didn't really know what to do with it. 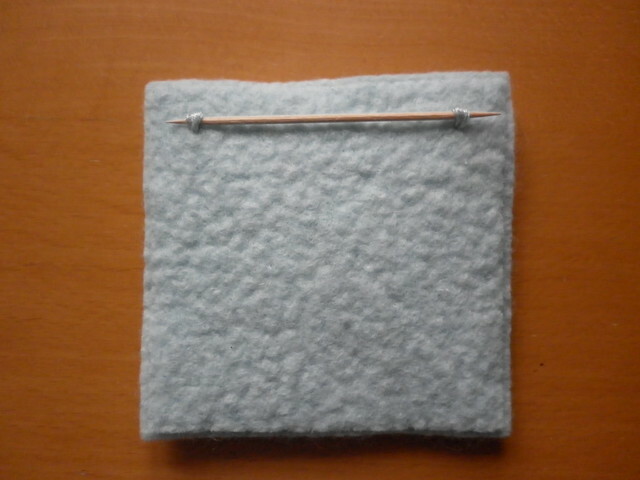 At first it was going to be a pin cushion, but I didn't have enough of the pale blue felt to make one with 'walled' sides, which was my intention. Then it was going to become the top of a box, but I didn't really need a box! Then it was going to go in a frame, but I didn't like the way it looked behind the glass. I'll show you the whole 'wall of minis' (which is a definite work in progress, just how I like it!) 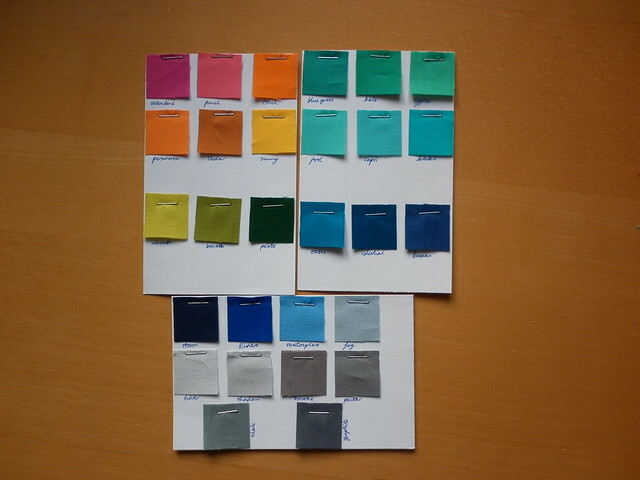 next time as I have another finish on there that I haven't yet blogged about. (Here's my 2015 FAL Q1 list.) I'm planning to post a 'round-up of Q1' post either tomorrow or Monday and will link up my final finish then. 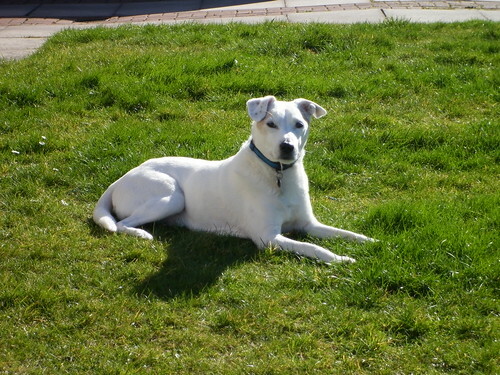 I do like to lie on the front grass and watch the world go by. Okay, technically I'm on next door's garden at this point but they don't mind!! Thanks for popping in, I'm linking up with Adrianne; why not have a look at all the projects that have been finished in the last three months - it's quite an impressive list!